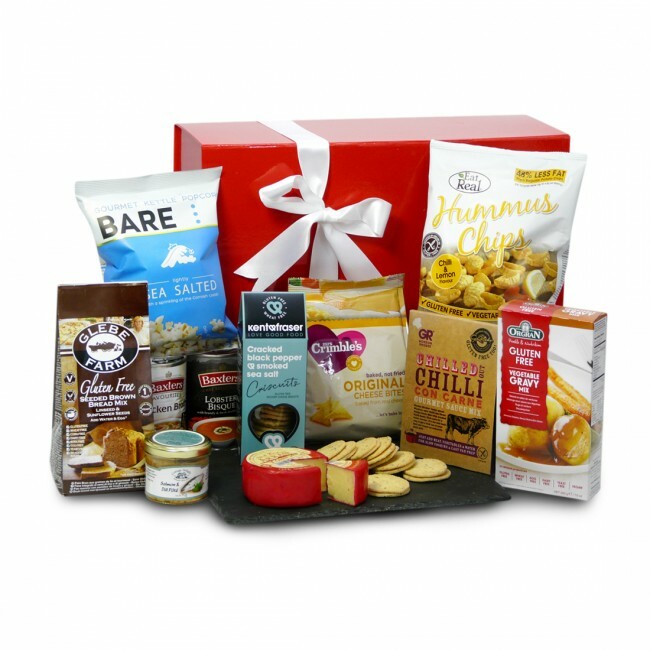 Designed as a gift for that special someone who always chooses savoury over sweet, the Savoury Selection gluten free gift box draws together favourite light snack and healthy lunch options. Smooth salmon pate and creamy Arran smoked cheese have been carefully hand-packed next to crisp savoury biscuits, great on a cheese board or as a snack. To continue the light theme, there are crunchy veggie crisps, lemon and chilli hummus crisps and gourmet popcorn. And for hearty lunches, try the soup selection and a feisty Chilli con Carne mix. The gluten free food and drink in the Savoury Selection Hamper is carefully packed by hand in a gorgeous red gift box. If substitutions are required, you will receive items that are the same (or higher) value and that will compliment your original selection.